Hello, Hello House-Mouse fans! 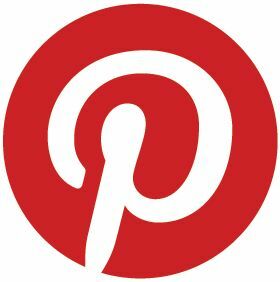 I have a post that is long overdue. showing 2 fun House-Mouse cards created for Mousey Teamie Heather's "Zodiac Sign Connection" Theme. I die-cut these images out directly from one of my House-Mouse Designs(R) paper pad Tablet (as below), then only added a little extra coloring with my Copics to brighten the images a little more. You can find these adorable Pads at the official House-Mouse Designs(R) site. Stamps: I love this image that is also on my House-Mouse Designs Stamp by Stampabilities, called "Sitting In The Rain" HMPR1002", featuring Amanda, Maxwell, Mudpie, Muzzy, from the Year 2001. 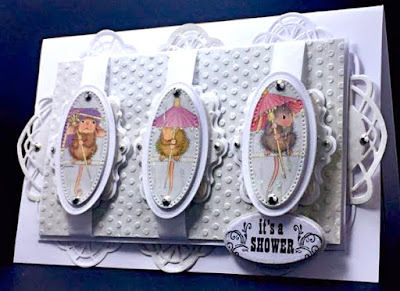 Studio G - Verse - "It's A shower"
Accessories: Cuttlebug Embossing Folders, Creative Expressions Craft Dies by Sue Wilson; Portuguese Collection Lisbon Dies (for background accents), Noble Dies Classic Adorned Rectangles Dies (for the pierced Ovals holding the mice), Canadian Collection Montreal and Toronto Dies (for framing panels behind each mice). "Creative Expressions and Sue Wilson Fans in the USA". 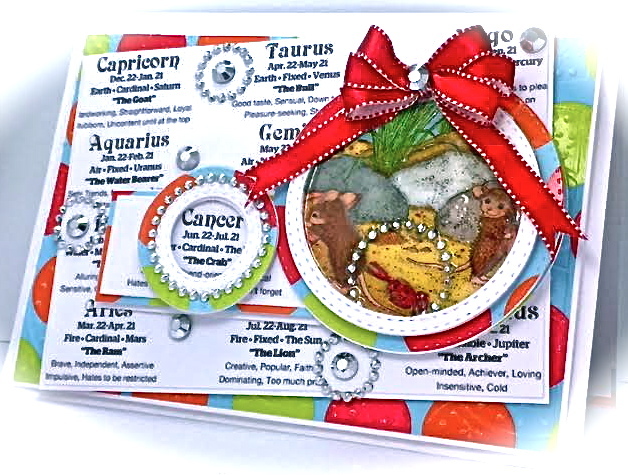 For this bright card, I've printed out the ZODIAC sign list (provided at HMFMC), for using as the background and mounted that on 2 layers of cardstock for weight and strength. The *Cancer* sign was also cut out of this print and matted on more die-cuts to show-off the description that clearly highlights "The Crab". On my colored mousey image panel, I have added an additional circle bling of rhinestones to show my tiny little crab and then used crystal effects to make the circle look glossy as in a globe. The background was dry embossed with a fun Spellbinders EF. CHECK-OUT the ZODIAC SIGNS to help you decide what connection you'll create at HMFMC, where there are loads of amazing takes from the DT. Play along this Challenge #HMFMC211. 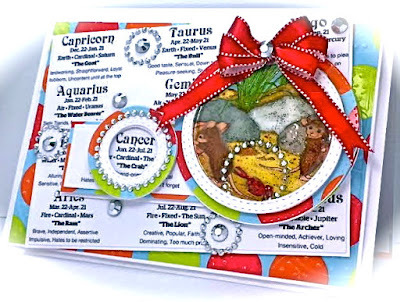 To help inspire you, be sure to stop by House-Mouse and Friends Monday Challenge Blog and enter for your chance to win a fabulous prize from our amazing and generous SPONSOR STAMPENDOUS! Thanks for stopping by today. I hope to have inspired your creativity and would love to hear from you! Happy Crafting! gorgeous and cute card America. I just love the cute little House Mouse baby card. It is adorable. A gorgeous card America, a super design with fabulous die-cuts and embossed panels. Your cute images are adorable and beautifully coloured!! What fabulous cards. I love how you did that first one, your so creative :).